Ben joined Brite as an administrator after a taste of recruitment while living in Bristol. Since that time he has progressed with the company through to Consultant level and has undertaken recruitment for national, regional and local clients in a diverse range of sectors including Utilities, Commercial/Office and Industrial. 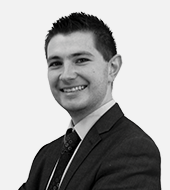 Currently focusing on the local market, Ben is a main point of contact for temporary and permanent vacancies.